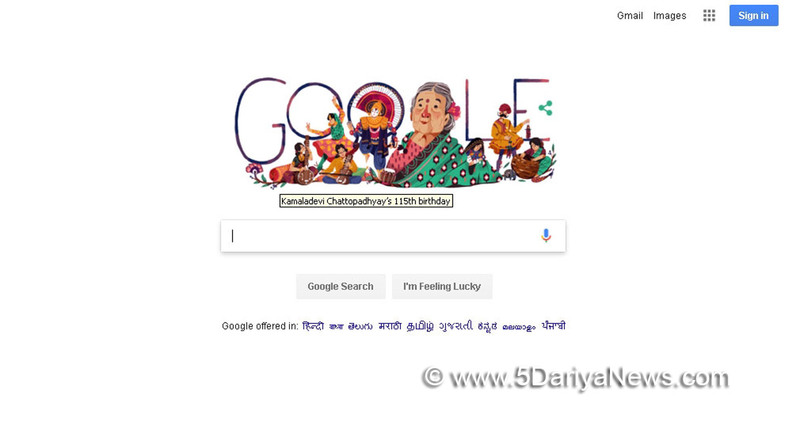 Search engine giant Google on Tuesday created a special Doodle to mark the 115th birth anniversary of Kamaladevi Chattopadhyay, hailed as a freedom fighter, social activist, actor and promoter of the arts.The Doodle, created by Finland-based Indian artist Parvati Pillai, depicts Chattopadhyay surrounded by many of the cultural objects and practices she fought to elevate and protect.It includes the various fields she promoted including instruments such as the sitar and the sarangi, Karthak dance, Chhau dance, embroidery, basket weaving and Kathaputli.Chattopadhyay's contributions to India were numerous. She was awarded the Padma Vibhushan in 1987 and was widely-known for persuading Mahatma Gandhi to call upon women to march with him in the Indian Independence Movement in the early 20th century.She is also credited with re-invigorating the culture of Indian handicrafts, handlooms and theatre and for using cooperative grassroots movements to pave the way for a higher socio-economic standard for Indian women around the country.Born in Mangalore in 1903, she married Harindranath Chattopadhyay when she was 20 and then moved to London where she graduated with a diploma in Sociology. She joined the Indian freedom movement when she returned to India.Chattopadhyay became the first woman to contest a legislative seat in India when she ran for the Madras Provincial Legislative Assembly.She had a career of several "firsts" -- from setting up some of the first national institutions to archive, protect, and promote Indian dance, drama, art, puppetry, music and handicrafts to becoming one of the few women of her time to propose that women's rights, religious freedoms, environmental justice, political independence and civil rights are all interrelated movements. "Happy 115th birthday, Kamaladevi Chattopadhyay!," Google said in its tribute.